Above is the apple crumble Pop Pie, which sounds like a delightful reimagining of a pop tart. Unfortunately, it’s dry. Maybe that’s inevitable considering it doesn’t have that layer of pasted sugar the original has. But it’s pretty much forgettable. This is a brown butter pecan pie-let. It’s ok, not as treacly sweet as a classic pecan pie. Probably not enough of the caramelized goodness of brown butter. 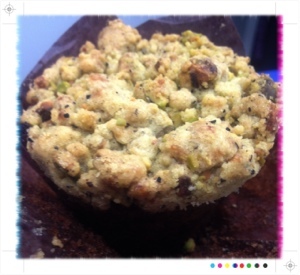 This is my favorite Cake Monkey treat that Demitasse carries, the spiced carrot muffin with pistachio crumble. It’s not the moistest muffin in the world, but being a muffin it is more moist than most other stuff I’ve had here. The carrots and pistachio add interesting flavors to the muffin, highlighting the adult restraint on the sweetness. 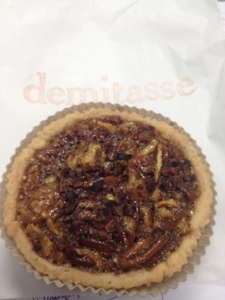 Demitasse has an especially good deal – a pastry and a cup of coffee for $5. This doesn’t include the siphon press coffee. But considering a grande drip and a berry coffee cake will cost $5 at Starbucks, it’s shocking to me that the masses queue up at Starbucks on 1st and Los Angeles when Demitasse is 50 yards away. But back to Cake Monkey. Other than that carrot muffin, I find their stuff visually appealing but generally disappointing (hey! I said the same about Starbucks!). This could be Demitasse’s fault in how they store things or how fresh the items are. But that pop tart convinces me it’s Cake Monkey’s sense of what It is they are trying to do. I’ve also had their monkey bread, what looks like their attempt to make a kind of morning bun. Not great. Maybe I’m misunderstanding what they’re doing, but it seemed kind of clumsy and heavy-handed to me. The final verdict is from their chocolate croissant. A croissant is probably the best thing to compare bakeries against each other because it is clear what these should be. The Cake Monkey version is not flakey, with the butter kind of soaking the layers flat. I love Demitasse. The owner, Bobby, is serious about coffee and is always there to talk about what you like in coffee. When they opened, Bobby wanted to feature the best of LA, using beans from Southern California (when it would have been so much easier to just use Stumptown and Four Barrel) and sweets from (the late) Jin Patisserie and Farmshop. He’s recently made the move to roast their beans sort-of-in-house (Trystero is actually doing the roasting for them). They brew your coffee with extreme care – Kyoto iced coffee drippers, Clever pourover, and Hario siphon presses, as well as a La Marrozco espresso machine. They use a burr grinder when you order and a digital scale to measure exactly how much to use. Good stuff. I’ll miss the local roasters they brought in, Augie’s in Redlands, especially. But I wish they would do something about their pastries. I would prefer more classically awesome pastries, like what you get at Bouchon Bakery or Cafe Laurent in Culver City. 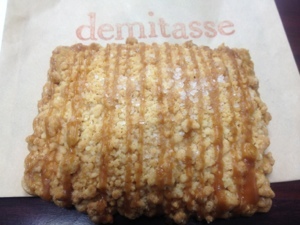 The gimmickry of Cake Monkey is a sad complement to Demitasse’s excellent coffee.